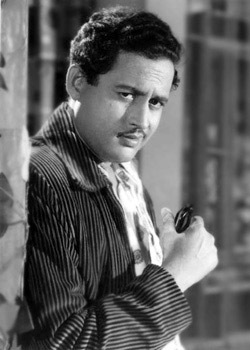 She's Guru Dutt's daughter and admits she doesn't remember him at all because he passed away when she was just two. Nina got to spend 10 years more with her mother but even Geeta Dutt went away too soon leaving her with the lingering taste of her crab curry. "My mother was a fabulous cook and I could always tell when someone else had made my favorite crab curry and would inevitably throw a royal tantrum," Nina laughs. She also holds on to the precious memory of music sittings with the top-ranking singer. "Ma would sit on the harmonium with me and make me croon 'Allah tero naam...' after her," Nina reminisces. Though Geeta was often ill during her growing up years, her daughter remembers her as a gentle but jovial person who loved being with her friends, was rarely mayoos and never lost her temper. Today, it's these remembrances and some unforgettable melodies that is all Nina has left of her mother. 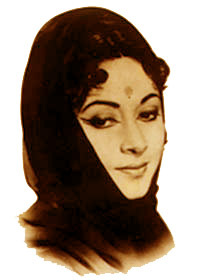 'Waqt ne kiya kya haseen situm...' is her chosen gem from Geeta Dutt's treasure trove. Incidentally, it's also her 17-year-old daughter, Nafeesa's best-loved song of her nani's though it's a "rather sad melody". "I guess 'Waqt ne kiya...' has grown on Nafeesa because she's heard me humming it all the time," Nina points out. This classic from Kaagaz Ke Phool does not figure in the video album that mother and daughter will be coming out with soon. Pal is a compilation of eight numbers. Six of them are original pop songs depicting moments from a woman's life at different stages and in a variety of moods. They have been penned by Manoj Kapadia and composed by Tutun Roy. The remaining couple of songs for which also Nina has lent her voice are remixes of two Geeta Dutt hits, 'Babuji dheere chalna...' from CID and 'Mera naam Chin Chin Choo...' from China Town. The latter will be filmed on Nafessa and the video will be directed by her father, Naushad Memon. Nina admits that her husband has been pushing her to cut an album for years but while the kids were growing up there was no time to spare. Now that Nafeesa is in college and her son in the 8th standard, Nina could let the germ of an idea blossom into what has already become a talked about project. The decision to include 'Chin Chin Choo...' stems from the fact that it's a fast-paced peppy numbers and both Naushad and Nina felt that with a new sound and a more contemporary look it could be used to target the youth. "I've loved the song since I was five years old and must have heard it over a 1000 times by now. It's got a very catchy beat," raves Nafeesa. The Home Science student who's only last year posed for her first photo shoot for designer clothes and jewellery, is all excited about appearing in the 'Mera naam Chin Chin Choo...' video. "It was mom who suggested my name to my dad and I was like 'Yeah, sure'," she giggles. They start shooting in 15-20 days and Nafeesa can't wait to face the camera again. "The mood is very abstract, the choreography very modern with lots of color, different dance movements and three changes for Nafeesa. It's not going to be anything like the 'Chin Chin Choo' you've seen before because while you can recycle an old hit using technology to give it a new sound, you can't go back to the same period and ape its pasteurization," points out her director father, adding with a smile, "So, I'd say our 'Chin Chin Choo...' is an old tune in a new package." Moving on to his singer-wife Naushad admits that Nina's voice is very different from her mother's. "There was a sharpness to Geetaji's voice, Nina's is more husky. That's why I advised her not to ape her mother. Not only would she find that difficult but given the fact that Geeta ji was a remarkable singer, it would be difficult for Nina to reach anywhere close to her. People remember the song but today in the age of remixes, I'm sure they would be open to a new sound and style given the fact that the singer is Geetaji's own daughter," he reasons. Despite his assurances and reassurances Nina admits that at the recording studio she was in jitters. "I have a very base voice so it was quite an effort to raise my scale to that of my mother's which was way to high for me," she confesses candidly. "All through the recording I was telling myself...telling her rather to 'be with me'." However, compared to 'Babuji dheere chalna...', Nina asserts, that 'Mera naam Chin Chin Choo...' was really a cakewalk. "'Babuji...' is a song with a lot of expressions and as you can imagine, it's not easy to imitate mom. I had to ensure that the "feel" of the song came through." Pal is Nina's tribute to her mother. She points out that a lot has been done to keep the memory of Guru Dutt and his movies alive. Nasreen Munni Kabir who penned the popular Guru Dutt—A Life in Cinema has recently released another book of 37 previously unpublished letters that Guru Dutt wrote to Geeta including a few postcards he sent to his sons, Tarun and Arun, Yours Guru Dutt—Intimate Letters of a Great Indian Filmmaker. Kabir has also done a TV series on him,In Search of Guru Dutt. A DVD compilation of his golden classics has also been brought out along with a commemorative stamp. In comparison, though Geeta Dutt's songs still play on radio channels, little by way ofshradhanjali has been paid to her memory which was the reason Pal was conceived. "May be if this experiment is accepted we can work on more of mom's songs including my favorite, 'Waqt ne kiya...'," Nina maintains. You wonder if Kaagaz Ke Phool ranks amongst her favorites from her father's repertoire too and you're surprised to hear that that's the film Nafeesa loves to rewind to. "It's so true-to-life. I love that scene in the studio when my grandfather's old. I never knew him but may be that's how he would have looked had he lived," the 17-year-old says wistfully. She also loves Subhash Ghai's Taal and yes, Guru Dutt's Shahib Biwi Aur Ghulam with Meena Kumari's heart-wrenching 'Na jao saiyaan chudake baiyaan...'. Sahib Biwi Aur Ghulam ranks on the top of Nina's list too. "All the characters stood out and I also love the zamindari ambience. I guess, it's because I'm half Bengali," she laughs. Another favorite is Chaudavin Ka Chand for its story and narrative flow. "You don't stop to think till the film is over," she says softly. Given Nafeesa's interest in modeling and her dance lessons with Shiamak Davar one wouldn't be surprised to find Guru Dutt and Geeta Dutt's granddaughter in the studio one day in front of the arc lights. Is Nina prepared for this? "My children have always been very independent and I like it that way. I want them to try everything they wish to do. You have one life so enjoy it. That's why we didn't stop her when she wanted to model or dance. If acting is what she wishes to experiment with next, we've no problems with that either. My parents were from the film industry and so is my husband. So why should I not want my daughter to be a part of the family too?" Waheeda rehman was a evil woman who destroyed the blissful life of the legendary couple , she even ruined kamaljeets life. she wil pay for her deeds in allah's court. Its shattering to read the lives of Guru and Geeta dutt,I will certainly will not take sides,the children must have suffered a lot and the elder son also committing suicide,due to strained relation in his marriage,he invested about 16 Lakhs for a film without keeping for his family,that speaks a lot. Even in one of his quotations he says he achieved everything he wanted,still he felt nothing,may be psychological disorder. I went through Geeta Dutt's life! A beautiful flower nipped in bud! Alas what right did this man have to shatter her dreams and life. I have nothing but to shed tears when I remember her. May her soul rest in peace. If at all she gets her rebirth she certainly deserves a better, understanding husband and certainly not a man like him! it brought tears to my eyes.it is not surprising that 2 people with such explosive talents cannot end up happily.may god bless their children.hope the media celebrates her achievments with as much fervour as they do for lataji n ashaji. I am an Advocate by profession and I am a founder member of one Trust and I conduct various charity programmes in order to donate to some orphanage, old age homes or institution of mentally challenged children. I love late Geetaji's songs. This years in the memory of Late Geetaji, I have been planning to conduct one show of Geetaji`s songs with all the prominent musicians in Pune, probably in Oct 2011. I would like to invite Mrs. Ninaji as a Chief Guest. I am also trying to invite some music director from Bombay for my show. I would also like to know your availability and your contact number so that I can meet you personally. Thanks.